This essay has just been published in Social Research: An International Quarterly, Volume 85, No. 3, Fall 2018, pp. 557-572. The whole issue is about essential books, and includes Lisa Anderson on Frantz Fanon, Rebecca Goldstein on Spinoza, and many other great essays. I recommend getting it. No book has been so vilified in the Christian West, while at the same time remaining so almost completely unread, as the Qur’an. Those who did at least delve into it put it to numerous and contradictory purposes. Churchmen such as Martin Luther cited it as the ultimate heresy. Enlightenment intellectuals such as Thomas Jefferson valued it for its post-pagan monotheism. In the early decades of the twenty-first century it has been libeled as a font of terrorism. Yet it is the scripture of a quarter of humankind. Prominent writers have often engaged with it as a staccato “heterotopia,” one continually constructed and forgotten, since for all its importance, it has never been part of the literary canon. We have come to the book by diverse and winding pathways. Author Al Young, whom Arnold Schwarzenegger as governor appointed California’s poet laureate, spoke of the profound influence on his craft of the music of jazz legend Yusef Lateef, whose performances he used to attend while growing up in Detroit. He wrote, “That he was Muslim intrigued us. Eventually, to understand a little about where Yusef was coming from, I read British Muslim Marmaduke Pickthall’s translation of the Qur’an: The Glorious Koran. And I was moved” (Young 2013). Young’s laconic response to the Qur’an (“I was moved”) differs in its brevity from that of the Scottish idealist philosopher and essayist Thomas Carlyle (1795–1881), who, however, was clearly also ultimately moved by it. He observed of his initial approach to the Muslim scripture: “I must say, it is as toilsome reading as I ever undertook. A wearisome confused jumble, crude, incondite; endless iterations, long-windedness, entanglement; most crude, incondite—insupportable stupidity, in short! Nothing but a sense of duty could carry any European through the Koran” (Carlyle 1840, 59). Carlyle’s remark is itself no paragon of style, repetitious and glib and faintly racist as it is (large numbers of “Europeans” of Muslim heritage in his own day read the Qur’an rapturously, from Sarajevo and Pristina to Edirne). Still, he went on to retract much of this polemic: “Yet I should say, it was not unintelligible how the Arabs might so love it.” Once you get a little distance from the text, he said, “the essential type of it begins to disclose itself; and in this there is a merit quite other than the literary one. If a book come from the heart, it will contrive to reach other hearts; all art and authorcraft are of small amount to that. One would say the primary character of the Koran is this of its genuineness, of its being a bona-fide book” (60). Genuineness was also key to Carlyle’s view of the Prophet Muhammad: “A false man build a religion? Why a false man cannot build a brick house … it is incredible that he should have been other than true” (41). The biographer of Friedrich von Schiller and translator of Johann von Goethe applied his idealist precepts to his consideration of the Qur’an, seeing an authentic noumenon through the allegedly disarrayed textual phenomenon. Emerson’s stress on the morally egalitarian character of the book was not misplaced. The chapter of The Chambers 49:13 remarks, “We created you male and female and made you peoples and tribes so that you might come to know one another. The most noble of you in God’s eyes is the most pious of you.” The verse clearly implies that a God-fearing woman is superior to an impious man, and that a pious person from a lowly ethnicity is better than an impious noble. Moreover, it implies that men have things to learn from women and noble tribesmen have things to learn from the lowly peasant. Carlyle’s inability to appreciate the sublime stylistic beauty of the Qur’an, which Arabs thought inimitable, may not be a matter of a European reading a non-European text as he thought. A longstanding suspicion among European academics that the Qur’an, like the New Testament, evolved over time in Near Eastern communities rather than having been recited in full by Muhammad ibn Abdullah in the early seventh century has increasingly been laid to rest by new manuscripts, dating techniques, and historical argumentation (Sinai 2017). Knowing when it was is important, but we have yet fully to place it in historical context as a text of Roman late antiquity. The Qur’an grew up in the late Roman Empire, likely recited by the Prophet not only in Mecca and Medina in Arabia but also, I and some others would now argue, on trade or missionary journeys after 613 in Transjordan, Palestine, and Syria, the latter having been Roman for half a millennium and whose cities used Greek for many purposes. It makes sense to see the book as “European”: The Qur’an uses a loan word from the Latin via strata (paved avenue) to refer to God’s straight path, spends more time praising Mother Mary than does the New Testament, sides with the Roman Augustus Herakleios (r. 610–41) in his war of defense against the grasping Iranian emperor Khosrow II (Rome 30:1), and appears to laud Herakleios as a second Alexander (whose capsule biography is told in chapter 18: van Bladel 2008, 175–202; Cole 2018). It is in its origins, like Christianity, a melding of Hellenistic and biblical motifs that congealed initially in the Roman Empire. The Qur’an is as European a text as Augustine’s City of God, which was, after all, produced in what is now Tunisia. Those inquirers put off by the scripture’s rhapsodic turnings perhaps suffer from what might be called the “Beowulf fallacy,” after J. R. R. Tolkien’s devastating essay, “The Monsters and the Critics” (Tolkien 1991, 14–44). Many observers, he said, viewed the work as putting “the irrelevances at the center and the serious things at the outer edges.” The structure of the whole poem, however, he argued, paralleled the meter of Old English (and Old Norse) poetry, where there was no rhythm but rather an equal number of random accented syllables in each hemistich. Likewise, Beowulf is in two parallel parts, with equal numbers of dramatic moments, rather than being a three-part Greek epic with a beginning, middle, and end. The Qur’an is said to have been arranged by one of the vicars of the Prophet, the commander of the faithful `Uthman (r. 644–56) by length of chapter, from longest to shortest, rather than chronologically over the life of Muhammad. The letters of Paul in the New Testament are largely organized according to the same principal of longest first, suggesting that this approach was common in late antiquity. It has been argued that the Qur’an and many other ancient texts proceed not linearly but by circling around a series of primary themes (Cuypers 2009). The biblical book of Isaiah, the Psalms, and even the works of Homer have this form. It may be that readers who are used to biblical narratives are confused by the Qur’an because it more resembles the Psalms or the letters of Paul. Lyrical and poetic, it is full of praises of God, wisdom sayings, and exhortations to an upright life (Ernst 2011). It is the prose version of jazz, which may help account for its popularity in that milieu; jazz has been a key arena of heterotopic conceptions of Islam (Aidi 2014, 112–15). “When she heard of their plotting, she sent for them and prepared for them a banquet, then gave each of them a knife. “When they saw him, they so lionized him that they sliced into their palms. Thomas Mann was so taken with the scene that he incorporated it into his 1933–43 Egyptological novel, Joseph and His Brothers (Mann 2005, 988–89). The Qur’an’s blinding monotheism and its paradoxical rhymed prose lie at the heart of this twentieth-century Argentinean conception of Islam. Borges interpreted the book’s unrelenting Unitarianism as making God “alone” or “lonely.” Perhaps he had in mind Sincerity 112:1–4: “In the name of God, the Merciful, the Compassionate: Say: He is God, unique; God, the eternal. He was not born, does not give birth, and has no peer.” This passage has sometimes been assumed to echo the Hebrew Bible. In my view, however, it is Hellenistic, speaking of the Deity as ungenerated and childless, unshakeable and in a category by himself. It seems to me that the few remaining Neoplatonists in Damascus in Muhammad’s own day, were the passage translated into Greek for them, would recognize a kinship with its discourse. Borges’s emphasis on the sword and conquest appears to reproduce the propaganda of the Spanish Reconquista. Whereas the Indo-European, Phoenician, or Gothic Vandal migrations into Spain were not remembered as alien, their Catholic majesties Ferdinand and Isabella and their successors configured the Arab, Amazigh, and Jewish populations of Iberia as having been interlopers, and proceeded forcibly to convert or expel them all. Borges attempted to reclaim al-Andalus as a positive Hispanic heritage as part of his struggle against Argentinean parochialism. While it may be that he could not escape some deeply embedded Orientalist tropes (Almond 2004), we should also beware of reading him too literally, since he was engaged not in a representation of the Other but in the construction of a modern Self. It is possible that the timid, bookish writer with failing vision set the Muslim swordsmen alongside the gauchos of the pampas and Buenos Aires back-alley knife fighters, whom he also fêted, as symbols of Iberian virility to which Argentineans were heirs. Being brave, Borges held, was even more important than being right (Wheelock 1975), and his literary Muslims were above all courageous. If Christians habitually looked at themselves, and at the followers of foreign religions, from the same point of view, there would be much less exultation over their own superiority. If the Koran declared that God said to Mohammed: “Smite Amalek. Destroy utterly all that they have, and spare them not; but slay man and woman, infant and suckling,” the text would doubtless have been quoted thousands of times by theologians, to prove the cruelty of Moslems, and the improbability that such a command came by Divine inspiration. (Child 1855, vol. 3, 438; see also Einboden 2014, 96). Child put her finger on a difference between those passages of the Hebrew Bible on warfare that deploy the notion of herem, or the necessity of annihilating the enemy, and the Qur’an. The Muslim scripture, I argue, stands in the Ciceronian tradition of Roman thinking about just war that Christian theologians such as Augustine of Hippo and Ambrose of Milan also took up, and allows only defensive military action, requiring humane treatment of prisoners of war (Cole 2018). The Qur’an does instruct believers to engage in warfare to defend Medina from the assaults of militant pagans. The chapter The Cow 2:190 says, “Fight in the path of God those who enter into combat against you, but do not commit aggression. God does not love aggressors.” The word “fight” has often been rendered as translators as “slay,” but since the Qur’an goes on to command that prisoners be taken (e.g., 9:5), it clearly has been mistranslated in many instances. In context, it means something like “deploy lethal force.” The Qur’an consistently demands that such force be applied only in self-defense, and both militant Muslim and older Western analyses of its verses that claim to find a progression away from defensive to offensive warfare have been shown to be incorrect (Firestone 1999; Bonner 2006). In seventh-century western Arabia, the wayward biblical communities who allied politically and militarily with the hostile polytheists are castigated as “those who paganized from among the people of the Book,” but the very need to so distinguish them demonstrates that ordinarily the adherents of biblical scripture are not put under the rubric of kafirs. Not even all the latter are viewed in a hostile manner. The Qur’an speaks of the prophet making treaties of alliance with pagan tribes around Medina. To focus only on the few verses concerning just war is, in any case, to distort the character of the book. Arabic, like Hebrew and Amharic, is a Semitic language based on three-letter roots. These roots are then put in morphological “molds” to create a wide vocabulary. The root for committing violence is used 170 times in the Qur’an (and of course is viewed negatively in the case of murder or aggressive warfare). The root for compassion occurs 339 times, and forms an important epithet for God himself. The root for the notion of forgiveness is used 234 times. Roots having to do with love and intimate friendship are used at least 124 times. The Qur’an 3:31 instructs the Prophet to address the people, “Say: ‘If you love God, follow me, and God will love you, and forgive you your sins; God is forgiving, compassionate.’” The contemporary Muslim puzzlement at the impression among outsiders (including Borges) that their scripture is bleak or severe and their God “terrible” thus has some statistical and textual support. It is a warm book full of mercy, clemency, and love. It is harsh toward unrepentant polytheists and the persistently unethical, but then so is the New Testament. Drinking mead from the skull-cup … to shasta and vedas admirant … minding the koran. Although Whitman’s playful universalism might at first glance seem entirely alien to the spirit of the Qur’an itself, this passage has some (much less extravagant) parallels in that book. The Cow 2:62 imagines an ecumenical community of Abrahamian monotheists in paradise: “Those who believed, and the Jews, and the Christians, and the Sabians, and whoever has believed in God and the Last Day and performed good works, they shall have their reward with their Lord.” (The Sabians were likely God-fearers, pagan monotheists who associated with Jews and Christians). Later in The Cow (2:135), the Qur’an complains of the groups who sentenced everyone outside their religion to hell: “They say: ‘Become Jews and Christians and be guided.’ No, the philosophy [Word] of Abraham, the pious gentile. He was no polytheist.” Muhammad insisted on a pluralism exemplified by Abraham, whose “word” or Logos of the unitary Ground of Being unites all the latter’s devotees. The intermingling of globalized identities was taken up by novelist John Barth (b. 1930) in his The Last Voyage of Somebody the Sailor, in which journalist and autobiographer Simon William Behler of East Dorset, Maryland, is somehow transported to Abbasid Baghdad and incorporated into the Sindbad tales of the Thousand and One Nights. Or they are incorporated into him. Scheherazade, whose stories forestall loss of virginity and death, falls silent, and Behler becomes a narrator, but also a protagonist who continues to be narrated by others. He falls in love with Sindbad’s daughter Yasmin, who “was a well-educated woman, versed in both the Koran and secular literature,” but who had never heard of the Book of the Thousand and One Nights and so cannot fulfill Behler’s request that she bring him a copy and a journal in which he can continue his memoirs (Barth 1991, 519). Barth appears to instance the Qu’ran here as the anti-Scheherazade, the icon of the grounded, integrated self, and Yasmin is the opposite of her father Sindbad in this regard. Behler ultimately cannot follow Yasmin when she leads him toward a mystical island she thinks she has glimpsed. He wanders in what may have been his final voyage toward the disintegration of the self. Even Yasmin’s grounding in the Qur’an and the wealth of secular Abbasid literature cannot offer him a cynosure or staunch the intermingling and dissipation of Behler’s postmodern self (Al-Madani 1999). There is something, it has been argued, of the dynamic and the transitional in Foucault’s heterotopian spaces, in which people move from one state to another. Whereas a utopia is literally “no-place,” an arena that does not exist, this third space exists, but exists in-between, like dusk or the line of a frontier (Fornari 2015). The Qur’an has subsisted in the literature of Christian and post-Christian Europe and the Americas in such a shifting borderland between self and other. The authors here instanced offset their provincialism with it, constructing a modernist universalism, or ironically critiqued the failings of their own traditions, or freed themselves from constricting orthodoxies, or failed to staunch their existentialist bleeding into nothingness. In our polarized twenty-first century, as Muslims burgeon toward amounting to a third of the planet’s population and are painted by our national security elites as successors to the Communists as threats to white capital, perhaps it is time to add to our repertoires of reading the Qur’an, supplementing the heterotopia of our littérateurs with robust and sustained historical, philosophical, and spiritual engagements with it as a key text of our Western and global heritage. Aidi, Hisham. 2014. Rebel Music: Race, Empire, and the New Muslim Youth Culture. New York: Vintage. Al-Madani, Yusur. 1999. “Deconstructing and Reconstructing a Narrative of the Self: John Barth’s The Last Voyage of Somebody the Sailor.” International Fiction Review 26 (1–2): 8–18. Almond, Ian. 2004. “Borges the Post-Orientalist: Images of Islam from the Edge of the West.” Modern Fiction Studies 50 (2): 435–59. Barth, John. 1991. The Last Voyage of Somebody the Sailor. New York: Little, Brown & Co.
Bonner, Michael. 2006. Jihad in Islamic History: Doctrines and Practice. Princeton, NJ: Princeton University Press. Borges, Jorge Luis. 1995. Poesía Completa. New York: Vintage Espanol. Carlyle, Thomas. 1840. Heroes, Hero-Worship and the Heroic in History. London: Chapman and Hall. Child, Lydia Maria. 1855. The Progress of Religious Ideas, through Successive Ages. 3 vols. New York: C. S. Francis & Co.
Cole, Juan. 2018. 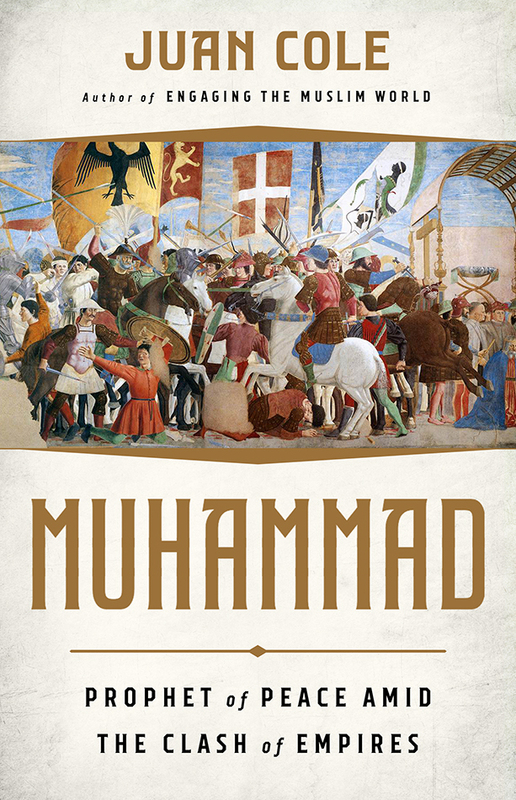 Muhammad: Prophet of Peace amid the Clash of Empires. New York: Nation Books. Cuypers, Michel. 2009. The Banquet: A Reading of the Fifth Sura of the Qur’an. Miami: Convivium Press. Einboden, Jeffrey. 2009. “The Early American Qur’an: Islamic Scripture and US Canon.” Journal of Qur’anic Studies 11 (2):1–19. ———. 2014. “’Minding the Koran’ in Civil War America: Islamic Revelation, US Reflections.” Journal of Qur’anic Studies 16 (3): 84–103. Emerson, Ralph Waldo. 1850. Representative Men: Seven Lectures. London: George Routledge . Ernst, Carl W. 2011. How to Read the Qur’an: A New Guide, with Select Translations. Chapel Hill, NC: University of North Carolina Press. Firestone, Reuven. 1999. Jihad: The Origin of Holy War in Islam. Oxford: Oxford University Press. Fornari, Emanuela. 2015. Heterotopías del mundo finito: exilio, transculturalidad, postcolonial. Villa Maria, Cordoba, Argentina: Eduvim. Johnson, Peter. 2013. “The Geographies of Heterotopia.” Geography Compass 7 (11): 790–803. Mann, Thomas. 2005. Joseph and His Brothers: The Stories of Jacob, Young Joseph, Joseph in Egypt, Joseph the Provider. Translated by John E. Woods. New York: Everyman’s Library. Sinai, Nicolai. 2017. Der Koran: Eine Einführung. Stuttgart: Reclam. Tolkien, J. R. R. 1991. “The Monsters and the Critics.” In Interpretations of Beowulf: A Critical Anthology, edited by R. D. Fulk, 14–44. Bloomington, IN: Indiana University Press. van Bladel, Kevan. 2008. “The Alexander Legend in the Qur’an 18:83–102.” In The Qur’an in Its Historical Context, edited by Gabriel Said Reynolds, 175–202. New York: Routledge. von Goethe, Johann. 1877. West-Ostlicher Divan. Leipzig: Philip Reclam. Translated as West-Easterly Divan by John Weiss. Boston: Roberts Brothers. Wheelock, Carter. 1975. “Borges, Courage and Will.” International Fiction Review 2 (2): 101–5. Whitman, Walt. 1855. Leaves of Grass. Brooklyn, NY: The Author.